Objectives To explore the beliefs and expectations of patients and their caregivers about home haemodialysis in Italy where the prevalence of home haemodialysis is low. Design Semistructured, qualitative interview study with purposive sampling and thematic analysis. Setting Four dialysis centres in Italy without home haemodialysis services (Bari, Marsala, Nissoria and Taranto). Participants 22 patients receiving in-centre haemodialysis and 20 of their identified caregivers. Results We identified seven major themes that were central to patient and caregiver perceptions of home haemodialysis in regions without established services. Three positive themes were: flexibility and freedom (increased autonomy, minimised wasted time, liberation from strict dialysis schedules and gaining self-worth); comfort in familiar surroundings (family presence and support, avoiding the need for dialysis in hospital) and altruistic motivation to do home haemodialysis as an exemplar for other patients and families. Four negative themes were: disrupting sense of normality; family burden (an onerous responsibility, caregiver uncertainty and panic and visually confronting); housing constraints; healthcare by ‘professionals’ not ‘amateurs’ (relinquishing security and satisfaction with in-centre services) and isolation from peer support. Conclusions Patients without direct experience or previous education about home haemodialysis and their caregivers recognise the autonomy of home haemodialysis but are very concerned about the potential burden and personal sacrifice home haemodialysis will impose on caregivers and feel apprehensive about accepting the medical responsibilities of dialysis. To promote acceptance and uptake of home haemodialysis among patients and caregivers who have no experience of home dialysis, effective strategies are needed that provide information about home haemodialysis to patients and their caregivers, assure access to caregiver respite, provide continuous availability of medical and technical advice and facilitate peer patient support. This study aims to explore the beliefs and attitudes of patients and caregivers about home haemodialysis in a region with very low rates of home haemodialysis use. Similar to patients on in-centre haemodialysis in other global regions, home haemodialysis is perceived as confronting and unsafe by patients on in-centre haemodialysis and their caregivers in regions without home haemodialysis services. Suggested strategies to increase the acceptability and uptake of home haemodialysis in regions without established services include educating patients about home haemodialysis as a treatment choice, assuring caregiver respite and providing round-the-clock technical and medical advice. Strategies that have been shown to improve uptake of home haemodialysis in other areas may be effective in regions establishing home haemodialysis programmes and warrant further evaluation. This is the first study to examine the expectations and beliefs about home haemodialysis among in-centre haemodialysis patients and their caregivers who have received no formal education, choice or experience of home haemodialysis. All interviews were conducted and coded in Italian to ensure that cultural and linguistic nuances were captured. The transferability of our findings to other settings is uncertain as all interviews were conducted in Italy and patients were recruited from four centres within Diaverum, a for-profit dialysis service provider. The reasons for highly variable global uptake in home haemodialysis remain incompletely understood. Previously identified barriers to home dialysis in the USA include inadequate dialysis service reimbursement or caregiver support, lack of innovative and patient-friendly dialysis equipment, competing business interests for dialysis providers, reliability of supplies and regulations that require frequent physician visits.11 Patients who are asked about self-care dialysis perceive that they have insufficient knowledge and skills to perform haemodialysis and are apprehensive about the unsupervised nature of home-based dialysis and social isolation.12 ,13 While more is known about the perceptions and expectations of patients who have home haemodialysis as an active treatment choice, the perceptions and beliefs held by patients and caregivers who have little experience or opportunity of home haemodialysis are less well understood and greater understanding of them may help clinicians and providers develop successful and sustainable home haemodialysis programmes in regions without established home-based services. Participants were eligible if they were an adult receiving in-centre haemodialysis or an identified caregiver who had not received specific education about home haemodialysis and for whom home haemodialysis was not an available treatment option. We defined caregiver as any adult person (eg, spouse, close friend or family member) who provided care or support on a regular basis for a person on haemodialysis. We purposively selected participants to ensure that we captured the perspective of patients from a range of age, access to a potential caregiver, duration of in-centre haemodialysis and interest in home haemodialysis as well as both genders and caregivers with a range of age, years of caring and relationships to patients and both genders. We specifically included some patients who might be eligible for home haemodialysis. All participants were recruited by their primary physician from four centres within Diaverum, a large dialysis provider in Europe, Australia and South America. The centres were located in four Italian cities (Bari, Marsala, Nissoria and Taranto) that do not currently provide home haemodialysis services. We developed an interview guide based on a literature review on home haemodialysis12 ,14–22 and on discussion among the research team (AT/SP/GS/JC). Two weeks before the interview, participants were given a brochure on home haemodialysis (provided in online supplementary Digital Content 1) and invited to ask questions of the research team. Before the interview, participants were provided standardised verbal and written information about home haemodialysis that described the range of potential dialysis modalities (peritoneal dialysis, in-centre haemodialysis and home haemodialysis, including frequent and/or nocturnal schedules). The in-depth interview questions and prompts are provided in boxes 1 and 2. In October and November 2011, trained qualitative researchers (MR and LG) conducted face-to-face semistructured interviews with patients and caregivers in Italian, the native language of both the interviewers and participants. Recruitment was ceased when theoretical saturation was reached, defined as the time point in which little or no new concepts arose from subsequent interviews. Contextual details were recorded after each interview. All interviews were digitally audio-recorded and transcribed verbatim in Italian language. What were your initial thoughts or reactions when you were told you needed dialysis? What about now? How do you feel when you go on dialysis and how do you feel between dialysis sessions? How has your life changed since you started dialysis? What is the most difficult or challenging thing about dialysis? How do you cope with it? Do you ever miss dialysis treatments, why? Does missing dialysis impact your well-being, how? What are your life priorities at the moment? Have they changed since before you started dialysis? Knowledge: Did you know about the different dialysis treatment options before starting dialysis? (peritoneal dialysis and haemodialysis) How did you come to know about them? Do you feel you received enough information about dialysis before you started dialysis, why? Decision making: Which one do you think is better, why? If you were given the option between haemodialysis and peritoneal dialysis, why did you choose your current dialysis treatment? How happy are you with the care and treatment you are receiving in the hospital, why? If you were in charge of this dialysis unit, what would you change to improve the experiences of dialysis patients? Knowledge: what have you heard about home haemodialysis? Is there anything else about home dialysis you would like to know about? Attitudes: Would you like to consider having haemodialysis at home? Why? Support: Do you know of someone who would help you if you did dialysis at home? Have you discussed with anyone about it, if so, what do they think about home dialysis? How long have you known your family member on dialysis? How has your life changed since your family member had to go on dialysis? What is the most difficult or challenging thing about caring for someone on dialysis? How do you cope with it? How do you feel about your situation and is there anything you can do to improve your situation? What are your life priorities at the moment? Have they changed since before caring for your loved one on dialysis? Do you have any health problems yourself? Can you describe these and how you manage your own health as well as the well-being of your family member on dialysis? How happy are you with the care and treatment your family member is receiving in the hospital, why? If you were in charge of this dialysis unit, what would you change to improve the experiences of dialysis patients or family caregivers? Role: What do you think your role would be if your family member did dialysis at home? What might be the biggest challenge in helping someone with doing dialysis at home? Do you think you would be able to cope with these roles and responsibilities? Attitudes: Would you like to consider having your family member do haemodialysis at home? Why? 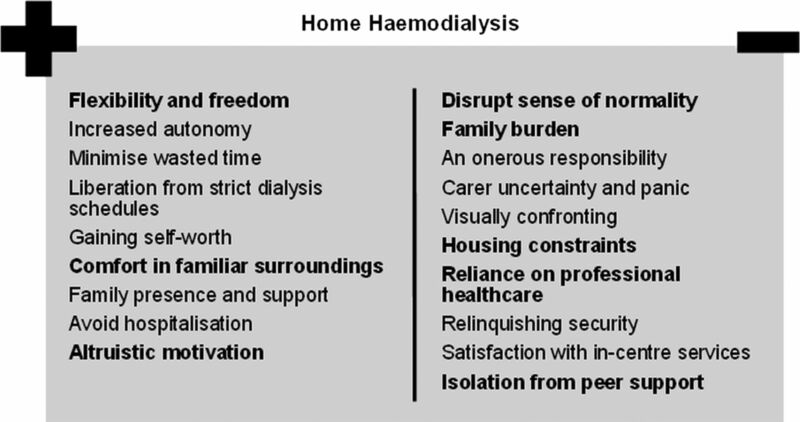 Barriers: What do you foresee might be practical problems with home haemodialysis? The transcripts were entered into HyperRESEARCH (ResearchWare Inc USA V.3.0.2), a software package for storing, coding and searching qualitative data. Drawing on grounded theory and thematic analysis,23 ,24 MR and LG coded the transcripts line-by-line in the Italian language. They then independently identified concepts inductively and grouped similar concepts relating to patient and caregiver beliefs and expectations of home haemodialysis. The concepts, descriptors and supporting quotations were translated by MR and LG into English for discussion. Through a series of discussions, three authors (MR/LG/AT) reviewed and refined the coding scheme to develop themes that captured all concepts relating to patient and caregiver perspectives on home haemodialysis. To enhance the analytical framework and potential for offering meaningful insight, the thematic schema were then discussed within the research team. Twenty-two haemodialysis patients and 20 of their identified caregivers participated in the study. All participants agreed to participate and their characteristics are provided in table 1. Each interview lasted between 20 and 90 min. Patients were aged between 34 and 78 years and the duration of dialysis ranged from 3 months to 26 years. Approximately half of the patients (n=9 (41%)) had a family caregiver and all except for one lived within a 30 min drive to the dialysis centre. Caregivers were aged between 38 and 78 years; most were women (n=17(85%)) and more than half (n=12(60%)) were in a spousal relationship with the patient. We identified three themes reflecting positive attitudes towards home haemodialysis: flexibility and freedom (increased autonomy, minimised wasted time, liberation from strict dialysis schedules and gaining self-worth); comfort in familiar surroundings (family presence and support and avoid the need for dialysis in hospital) and altruistic motivation. We identified four themes that encompassed negative attitudes: disrupted sense of normality; family burden (an onerous responsibility, caregiver uncertainty and panic and visually confronting); housing constraints and reliance on professional healthcare (relinquishing security, isolation from peer support and satisfaction with in-centre services). A thematic schema is provided in figure 1. Illustrative quotations to illustrate each theme are provided in table 2. Quotations are also available in the original Italian language (see online supplementary Digital Content 2). Thematic schema of patient and caregiver beliefs and expectation about home haemodialysis. Increased autonomy—The participants were aware they could choose their own treatment schedule with home haemodialysis, which meant that they would be able to continue to work and participate in other day-to-day activities by scheduling dialysis away from these commitments. Some respondents believed that home haemodialysis would be particularly suited to younger patients, providing them with the opportunity to manage their multiple family, social and work roles better and increase their availability for employment. Minimise wasted time—Both patients and caregivers anticipated that they would not have to waste time travelling while on home haemodialysis, which would give them additional freedom to do ‘normal’ activities. Patients were particularly frustrated about waiting in the dialysis clinic before starting dialysis and waiting for transport to return home. Liberation from strict dialysis schedules—Some patients felt that adhering to time-intensive and rigid dialysis schedules was stressful and burdensome. Patients felt physically and psychologically burdened by the rigid constraints of in-centre haemodialysis schedules and expected that home haemodialysis would offer increased flexibility and freedom. With home haemodialysis, the participants felt they would no longer be ‘mentally obliged’ to attend their scheduled dialysis session in-centre. Gaining self-worth—Some participants believed that doing home haemodialysis would allow them to provide better support for their family. One patient, who was a father, felt that home haemodialysis would allow him to work more and better provide for his family financially. Family presence and support—Home haemodialysis was perceived by patients and caregivers as a preferred option for some patients who desired to be in their own home or with their family while having treatment. Some caregivers also felt that patients would feel more relaxed and comfortable at home with their family when on dialysis. Avoid the need for dialysis in ‘hospitalisation’—Some participants felt they would prefer being at home rather than in clinic, because at the clinic they were surrounded by ‘sickness’. At home, they believed they would be in better ‘frame of mind’. Patients expressed that they wanted to have treatment in their own bed and did not want to see and interact with other sick patients, which some thought ‘magnified’ their own disease identity. A few patients expressed a keenness to help others and believed that they would consider home haemodialysis to set an example for other patients. One patient believed that haemodialysis offered a new opportunity for patients to be actively involved in their own care. Another patient, who was also a physician, felt that starting home haemodialysis himself would ‘spur the authorities’ to consider offering home haemodialysis as an option. Living with a haemodialysis machine at home was perceived by some patients to be an unrelenting reminder of their disease. Some participants felt they would be unable to escape their disease and medical burden on home haemodialysis. An onerous responsibility—Participants, both patients and caregivers, believed that home haemodialysis would be an overwhelming responsibility for family caregivers. They felt it would be unjustifiable and unfair to ‘enslave’ caregivers with the physical and emotional burden of dialysis. They thought that if a caregiver had to be present during the hours they were on dialysis, caregivers would therefore have to make significant personal sacrifices impacting their work and social lives. Some caregivers expressed apprehension about taking on the responsibility of dialysis and believed they would be afraid or unable to see their loved one ‘suffer’ while on the dialysis machine. One caregiver stated that they did not want to be blamed and scolded by the patient if they experienced a problem with the dialysis machine. Caregiver uncertainty and panic—Many caregivers felt inadequate, apprehensive and unable to perform dialysis care and manage complications. For example, caregivers were afraid of needles and felt unable to assist with cannulation. Caregivers anticipated they would be incapacitated by panic and unable to help the patient if they encountered a technical problem or complication. Even with training, caregivers doubted they could successfully manage medical responsibilities which they perceived belonged to professional medical healthcare providers who had necessary expertise, training and experience. Visually confronting—Some patients believed that having the haemodialysis machine at home would be too confronting for their family. For example, they thought family members would feel distressed at the sight blood and needles, and that home haemodialysis would be particularly ‘traumatic’ for young children. Both patients and caregivers believed that home haemodialysis would limit their living space and they were therefore reluctant to consider having a haemodialysis machine in their living space. Participants also thought that home haemodialysis would not be feasible because they had inadequate room to accommodate a machine at home. In addition, patients were concerned that they would be unable to make the necessary plumbing or electrical modifications for a dialysis machine if they did not own their home. Some felt that they were unable to ensure sufficiently sterile conditions for home haemodialysis. Relinquishing security—Participants appreciated that physicians and nurses had more experience and expertise, which provided them with a sense of reassurance. They believed staff could remain composed and manage emergencies or complications if they occurred. For home haemodialysis, some participants were worried they might be left alone in managing their dialysis treatment. Satisfaction with in-centre services—Some caregivers believed patients were contented with the quality of care received in the centre. They thought services were efficient and described the centre as having a ‘comforting and familiar atmosphere’. Most participants also lived in close proximity to the centre and transport was coordinated and paid for by the dialysis provider. Therefore, they had little motivation or ‘reason’ to opt for home haemodialysis instead of in-centre haemodialysis. Caregivers and patients felt that patients benefitted from the social support and camaraderie they received from staff and patients in the clinic. They believed that home haemodialysis meant losing contact with patients and staff, whom they relied on for support to cope with their disease. This study highlights positive (flexibility and freedom, comfort in familiar surroundings and altruism) and negative (disrupted sense of normality, family burden, housing constraints and healthcare by ‘professionals’ not ‘amateurs’) patient and caregiver perspectives that are relevant when considering patient acceptance and uptake of home haemodialysis in regions without established home-based haemodialysis care. Patients and caregivers who have no direct experience of home haemodialysis believe that home haemodialysis can offer them more flexibility, freedom and time for family and work and provide physical and mental liberation from strict in-centre haemodialysis schedules. Some perceive that starting home haemodialysis is an opportunity to be an ‘exemplar’ for other patients, which might promote the wider acceptance and uptake of home haemodialysis by others. However, despite the potential advantages of home haemodialysis, patients and caregivers in these regions are very concerned that home haemodialysis will be an overwhelming physical and emotional burden on caregivers and families. Patients and caregivers lack confidence that they have sufficient expertise and emotional fortitude to accept the medical responsibility of managing dialysis and its potential complications. They believe that performing home haemodialysis means relinquishing a sense of security provided in a supervised dialysis unit and will isolate them from the support of clinicians and their peers. Caregivers, in particular, believe that patients are contented with the quality of care received in dialysis centres and would not consider home haemodialysis. Our findings in patients on in-centre haemodialysis and their caregivers in regions without home haemodialysis services are remarkably coherent with those reported by patients established on in-centre haemodialysis in other clinical settings, including in regions that have active home haemodialysis programmes. An observational study of individuals on in-centre haemodialysis who would be eligible for nocturnal home haemodialysis found that such patients had little interest in starting nocturnal home haemodialysis (haemodialysis at home for 6–8 h, 4–6 nights/week) due to lack of confidence in performing nocturnal haemodialysis and self-cannulation, concerns over lower quality of care and fears of catastrophic clinical events on home haemodialysis.12 In a survey of in-centre haemodialysis patients, prominent reasons for not choosing self-care dialysis (peritoneal dialysis and home and self-care haemodialysis) similarly included a belief patients should not be unsupervised on haemodialysis, fear of social isolation from peers, perceived lack of efficacy in performing self-care and needle phobia.25 Previous research has shown that maintaining the status quo is an important factor when patients choose a dialysis modality.13 ,14 When balancing treatment alternatives, patients may be reluctant to change to a new treatment modality even when potential advantages are identified and recognised. This phenomenon is observed even in patients on in-centre haemodialysis in areas with relatively high home haemodialysis use, such as Australia,26 and may explain why patients already established on in-centre haemodialysis across multiple settings identify strong and consistent barriers to home haemodialysis regardless of the availability of home haemodialysis services to them. Our findings have important implications for successful initiation and implementation of new home haemodialysis programmes in regions without established services. It appears that regardless of whether patients have access to home haemodialysis services, patients who have become established on conventional in-centre haemodialysis may be largely negative about home haemodialysis and view it as confronting and lack confidence in their ability to learn the technique. In contrast, patients experienced in home haemodialysis in other regions may be more positive and enthusiastic about home haemodialysis as a treatment choice and report generally high levels of satisfaction.15 ,16 This disparity in attitudes and perceptions of home haemodialysis associated with current treatment modality suggests that discussions about treatment options for end-stage kidney disease that include home haemodialysis should be tailored to the existing haemodialysis experiences of patients and their families, and such targeted education may increase the acceptability and subsequent uptake of home haemodialysis for all patients. Consistent with this approach, earlier studies have shown that patients and their caregivers in the predialysis phase of care and who have received comprehensive predialysis information about all modalities of dialysis treatment (including conservative care) are more likely to choose a home-based dialysis modality over other treatment options.27–29 However, given that the majority of the small number of home haemodialysis patients in the USA has experienced in-centre haemodialysis before starting home therapy, it is likely patients and caregivers concerns about home haemodialysis can be overcome with intensive educational strategies. Accordingly, the effectiveness of education about home haemodialysis for patients currently treated with in-centre haemodialysis warrants further study. In addition, given the present study is conducted with patients and their families currently treated with dialysis, the effects of predialysis education on patient and caregiver treatment preferences in regions without established home haemodialysis also deserve further evaluation. We have generated potential strategies and recommendations to increase the acceptability of home haemodialysis among patients and family caregivers in table 3 based on our data and the existing literature. We acknowledge that the relevance, appropriateness and effectiveness of these strategies may be different between predialysis and prevalent dialysis patients. The educational and support interventions may be delivered by specific nurse specialists involved in predialysis care and education and included as a part of predialysis clinics. Moreover, we suggest establishing database management and communication between the team members to plan and implement educational strategies, offering group education with patients and families, providing video-based and online materials for patients and families and allowing patients and families to meet other patients who are established on home therapies. As a result of scarce data, further research is required to assess whether specific education strategies and support networks will increase the preference for and acceptability of home haemodialysis for patients and their caregivers in our regions. Although patients on peritoneal dialysis report greater satisfaction with care than patients on in-centre haemodialysis,31 additional research would provide valuable insight into the relative satisfaction of patients on differing home based therapies (haemodialysis and peritoneal dialysis). Limited high-quality data are available on the effect of information and support strategies for caregivers of people with chronic kidney disease; additional development and evaluation of services that specifically support carers and families would be valuable.32 Recently, a randomised trial has shown that more frequent in-centre haemodialysis (6 times/week) may improve survival and cardiovascular outcomes compared with conventional (3 times/week) in-centre haemodialysis.33 Adequately powered randomised trials of home haemodialysis (long-hours, increased frequency or nocturnal) compared with in-centre haemodialysis would provide more information on the effects of home haemodialysis on survival and quality of life. Increased utilisation of home haemodialysis has been strongly advocated to promote autonomy, self-sufficiency, and a sense of mastery in the management of end-stage kidney disease and may improve clinical outcomes and overall patient well-being. However, despite the potential for increased independence and treatment freedom with home haemodialysis, patients established on in-centre haemodialysis are generally negative about home haemodialysis and hold concerns about caregiver burden, treatment intrusiveness, and their inability to manage dialysis and its potential complications. It is likely these perspectives and attitudes toward home haemodialysis are common to all patients established on in-centre haemodialysis regardless of the availability of home services in their region. Individualised education and information for patients and their families approaching end-stage kidney disease is therefore needed before patients start dialysis. Specific education about home haemodialysis and opportunities to learn from the experiences of other home dialysis patients in the predialysis phase of care may increase patient acceptability and uptake of home haemodialysis in regions without home haemodialysis services. In addition, educational strategies that increase patient acceptance of home haemodialysis once they have commenced in-centre haemodialysis warrants investigation. We would like to thank all the patients and caregivers who volunteered their time to participate in this study.
. Chapter 4. Method and location of dialysis. In: Australia and New Zealand Dialysis and Transplant Registry (ANZDATA) Registry 2009 report. Adelaide: ANZDATA, 2009. US Renal Data System. USRDS 2010 Annual Data Report: Volume Two Atlas of End-Stage Renal Disease in the United States. Bethesda, MD: National Institutes of Health, National Insitute of Diabetes and Digestive and Kidney Diseases; 2010.
. Survival among nocturnal home haemodialysis patients compared to kidney transplant recipients. Nephrol Dial Transplant 2009;24:2915–19.
. Comparison of mortality with home hemodialysis and center hemodialysis: a national study. Kidney Int 1996;49:1464–70.
. Effect of frequent nocturnal hemodialysis vs conventional hemodialysis on left ventricular mass and quality of life: a randomized controlled trial. JAMA 2007;298:1291–9.
. The effects of frequent nocturnal home hemodialysis: the frequent hemodialysis network nocturnal trial. Kidney Int 2011;80:1080–91. Guidance on home compared with hospital haemodialysis for patient with end-stage renal failure: NHS National Institute for Clinical Excellence,London UK, 2002. U.S. Renal Data System, USRDS 2009 Annual Data Report: Atlas of End-Stage Renal Disease in the United States. Bethesda, MD: National Institutes of Health, National Institute of Diabetes and Digestive and Kidney Diseases; 2009. The United Kingdom Renal Registry. Chapter 4. UK ESRD Prevalent Rates in 2008: national and centre-specific analyses, 2009. http://www.renalreg.com/Reports/2009.html (accessed 2 Jun 2011).
. Home haemodialysis-international trends and variation. Nephrol Dial Transplant 2006;21:1934–45.
. Systematic barriers to the effective delivery of home dialysis in the United States: a report from the public policy/advocacy committee of the North American Chapter of the International Society for Peritoneal Dialysis. Am J Kidney Dis 2011;58:879–85.
. Patient-perceived barriers to the adoption of nocturnal home hemodialysis. Clin J Am Soc Nephrol 2009;4:784–9.
. Recruitment and training for home haemodialysis: experience and lessons from the nocturnal dialysis trial. Clin J Am Soc Nephrol 2010;5:1614–20.
. The views of patients and carers in treatment decision making for chronic kidney disease: systematic review and thematic synthesis of qualitative studies. Br Med J 2011;340:c112.
. Characteristics of dialysis important to patients and family caregivers: a mixed methods approach. Nephrol Dial Transplant 2011;26:403846.
. Older peoples’ satisfaction with home-based dialysis. Nephrology 2010;15:464–70.
. Satisfaction with renal replacement therapy and education: the American Association of Kidney Patients survey. Clin J Am Soc Nephrol 2011;6:605–12.
. The United States’ perspectives on home dialysis. Adv Chronic Kidney Dis 2009;16:189–97.
. Quality of life in patients treated with hemodialysis or peritoneal dialysis: what are the important determinants. Clin Nephrol 2003;60:341–51.
. Patients’ views regarding choice of dialysis modality. Nephrol Dial Transplant 2008;23:3953–9.
. The experience of individuals with renal failure participating in home haemodialysis: an interpretative phenomenological analysis. J Health Psychol 2011;16:884–94.
. Establishing a successful home dialysis program. Blood Purif 2006;24:22–7.
. Qualitative research methods. Melbourne: Oxford University Press, 2009.
. Interviews. Thousand Oaks, CA: Sage Publications, 1996.
. Why patients with ESRD do not select self-care dialysis as a treatment option. Am J Kidney Dis 2003;41:380–5. Kidney Health Australia. Consumer perspectives on dialysis: first national census. Melbourne. 2011. http://www.kidney.org.au (accessed 10 Jul 2012).
. Opinions of elderly people on treatment for end-stage renal disease. Gerontology 1999;45:156–9.
. Validity of a standard information protocol provided to end-stage renal disease patients and its effect on treatment selection. Perit Dial Int 1999;19:471–7.
. Dialysis modality preference of patients with CKD and family caregivers: a discrete-choice study. Am J Kidney Dis 2012;60:102–11.
. The impact of education on chronic kidney disease patients’ plans to initiate dialysis with self-care dialysis: a randomized trial. Kidney Int 2005;68:1777–83.
. Patient ratings of dialysis care with peritoneal dialysis vs hemodialysis. JAMA 2004;291:697–703.
. Support interventions for caregivers of people with chronic kidney disease: a systematic review. Nephrol Dial Transplant 2008;23:3960–65.
. In-center hemodialysis six times per week versus three times per week. N Engl J Med 2010;363:2287–300. Contributors AT participated in the design of the study carried out the thematic analysis and drafted the manuscript. SP designed the study, participated in the thematic analysis and critical review of the first and subsequent manuscript drafts. BM and JC provided intellectual input into first and subsequent manuscript drafts and assisted with thematic analysis. MR and LG did the interviews, coded and analysed the data, and provided intellectual input into subsequent manuscript drafts. DWJ assisted with thematic analysis and provided intellectual input into primary and subsequent drafts. JH, MO and SF provided intellectual input into subsequent manuscript drafts. GS conceived the study, obtained funding, assisted with study design and thematic analysis, provided intellectual input into subsequent manuscript drafts and is the guarantor. All authors, external and internal, had full access to all of the data in the study and can take responsibility for the integrity of the data and the accuracy of the data analysis. Funding The study has been part-funded by an unrestricted grant from Diaverum Renal Services Group, a global provider of renal services. The study sponsor commissioned the work to an independent steering committee and had no role in study design; collection, analysis and interpretation of data; writing the report and the decision to submit the report for publication; AT is supported by the National Health and Medical Research Council Early Career Fellowship ID 1037162; SP is supported in part by an by an unrestricted grant from Amgen Dompé administered by the Mario Negri Sud Consortium, Italy; DJ has received research grants, travel sponsorships and consultancy fees from Baxter Healthcare and Fresenius Medical Care and is a current recipient of a Queensland Government Health Research Fellowship. JH is Chief Medical Officer at Diaverum, a global provider of renal services; GFMS is Senior Vice President Scientific Affairs at Diaverum, a global provider of renal services: No other relationships or activities that could appear to have influenced the submitted work. Ethics approval Ethics approval was sought from all participating centres according to Italian law by informing the ethics committees (Italian Republic. Determination of the Italian Medicines Agency of 20 March 2008 (in Italian). Official Gazette of the Italian Republic. General Series No. 76; 31 March 2008). All participants provided written voluntary informed consent.